Here are some pictures from Creamie’s birthday party on Saturday. I knew it looked cute in my head, and I am so glad that it came together as I imagined it! The bunting/garland is one I made to hang at the window in my craft room a few months ago. It was perfect for her party, and free! 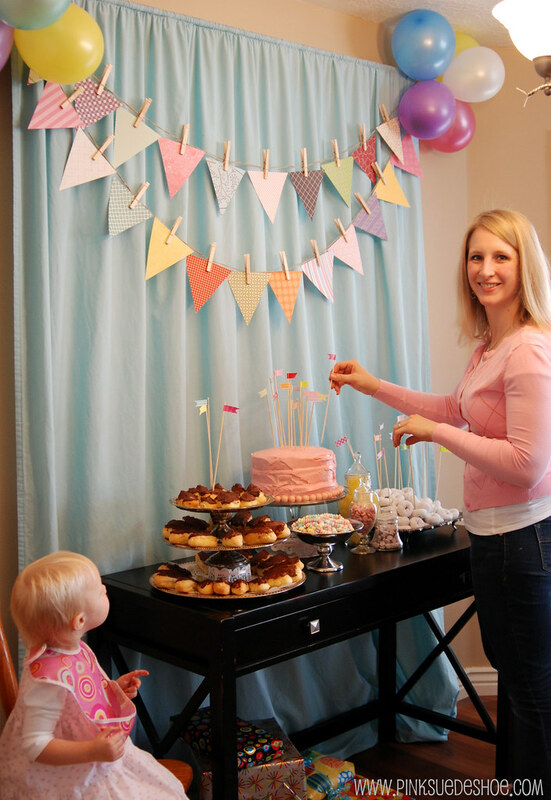 The backdrop was a thrifted sheet that I bleached a few times to turn it the right color, and then sewed into a curtain. This pretty silver tray was a gift from my dad a few years ago. It originally came from his parents. It was one of their wedding gifts. I love it so much. Also, powdered donuts are maybe my favorite thing in the world. Or Oreo’s. One case of bottled water was cheaper than a package of clear plastic cups. Amazing. A few minutes in Illustrator and I had some new labels to make them adorable. I just printed them off on my inkjet printer and used a little double sided tape to hold them on. If it hadn’t been 2:30 in the morning when I finished this project, I might have taken them to a copy center, and had them printed on a laser printer. As soon as water dripped on the paper the ink started to run. But really, she was two. And no one really cares about that kind of stuff, right? We had a lot of cake. A deliciously large amount of cake. I made the three layer neopolitan cake for Creamie’s birthday, and I thought that would be the only cake we had. But my sweet mom decided that I needed a cake too (my birthday is next Sunday, and we probably won’t have another family shin-dig before then). She made the white chocolate raspberry cake which tasted every bit as good as it sounds. And then my brother made a chocolate mint cake for his wife (you can’t see them, but there are Andes mint chocolate chips in there!). Her birthday is on Valentines Day but their family will be in Disneyland. So we celebrated birthday’s for four girls yesterday. And birthday’s for four means you need a lot of cake. Apparently that is the (pretty awesome) rule. So, to give you a peek into the not so photogenic side…. 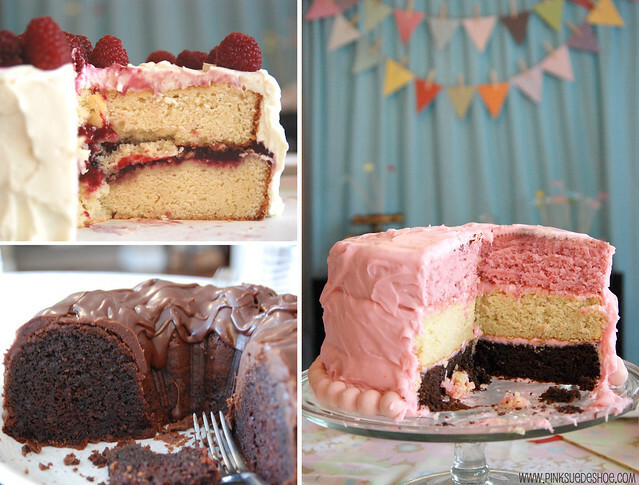 I was up at 6 am on Saturday to make three kinds of cake so I could create my neopolitan vision. When my first guest arrived I still had wet-from-the-shower-hair, no makeup, and this table was still largely undecorated. Scott was setting up the camera and checking lighting and whatnot and snapped this pic while I was finishing sticking all those little flags in the treats. Midway through the party I remembered I didn’t buy any candles. I thankfully had five stuffed in a drawer. Five candles to split between four birthday girls. Also, in a very classy (and photographed, but definitely not postable photographs!) moment, my brother took a dare. And he proceeded to put 35 lemon drops in his mouth at the same time while we all watched in horror and amazement and slowly counted out loud and in unison. Yep, thirty five. Plus one more in each nostril. See, classy. Though I don’t think I’ve ever laughed so hard. It’s just barely after midnight and I’m finally going to bed. Happy Monday! So funny about the lemon drops! You look so pretty, all matchy matchy with the decorations! What a beatiful birthday party! 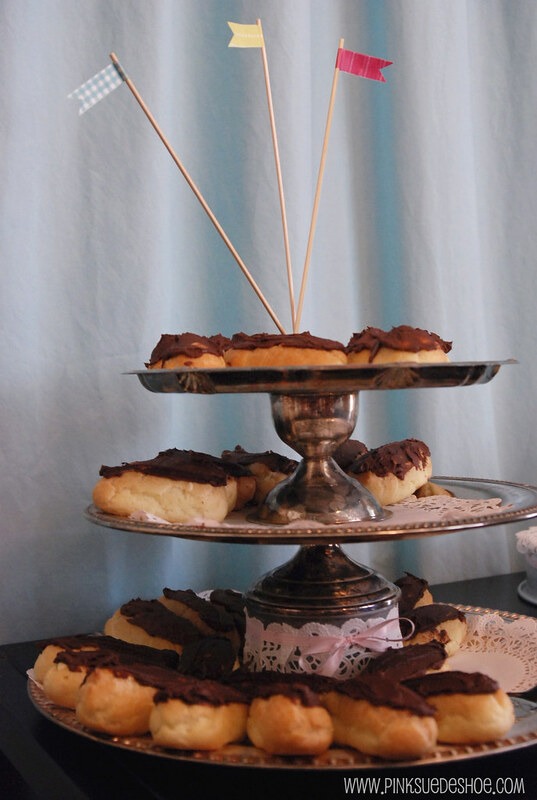 mmmmm, the cakes look scrumptious….I’m going to be cheeky now!! Would you mind e-mailing me or posting the recipe for the white chocolate raspberry one, pretty please?! You’re a very clever girl, Thanks for sharing…. Happy Birthday to everyone! Hooray for birthdays! Ummm, can you plan my next Birthday party? Those treats look amazing! Homemade eclairs are definitely a great weakness of mine. Sad to admit I have not made them since High School. Super cute! You are so talented and those cakes look amazing, seriously i want some! 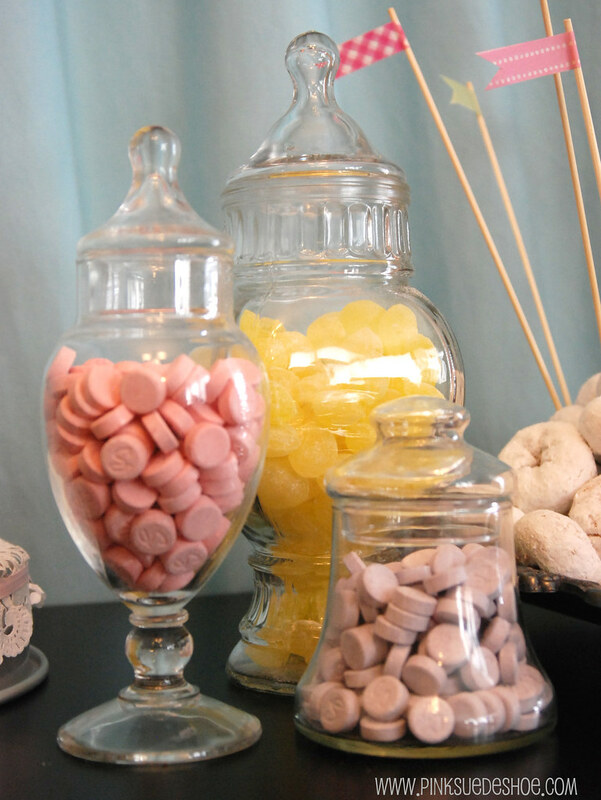 I want pics of B. stuffing his face full of lemon drops. Pretty please with neopolatin cake? Can your family please adopt me? I don’t think I’ve known a family that loves cake as much as me. Honestly, your brother made a cake? Wow. Everything looked so sweet and pink and adorable. I adore the pix of Creamie with her new typewriter, especially the one where she snuck away to type her thoughts in private with no distractions. Clever 2 year old. beautiful! and, yes, the treats were amazingly delicious. i was trying really hard not to look like a pig in front of my in-laws, but after they left i devoured everything. of course, by then, my boys had already made a big dent in everything. i might need some recipes. griff’s b’day is coming up in a couple weeks. What a sweet party! I love the ingenuity of the thrifted sheet and the label-less can of chicken. P.S. I don’t think you look bad without the hair and makeup done. For me, a picture like that would be, as you call it, unpostable. Uh, first of all I second heidikins! I want a pic of B with the lemon drops!!! HA HA! And secondly, you make the rest of us moms look pathetic. Little E got ladybug cupcakes on a red table cloth… hmmm…. I did make a banner, maybe I get a bonus point for that!! Love you… when are we getting together again?!?!?! I have three words for you — A-MA-ZING! With emphasis on the ZING! That is one fabulous party. Everything looks so perfect! 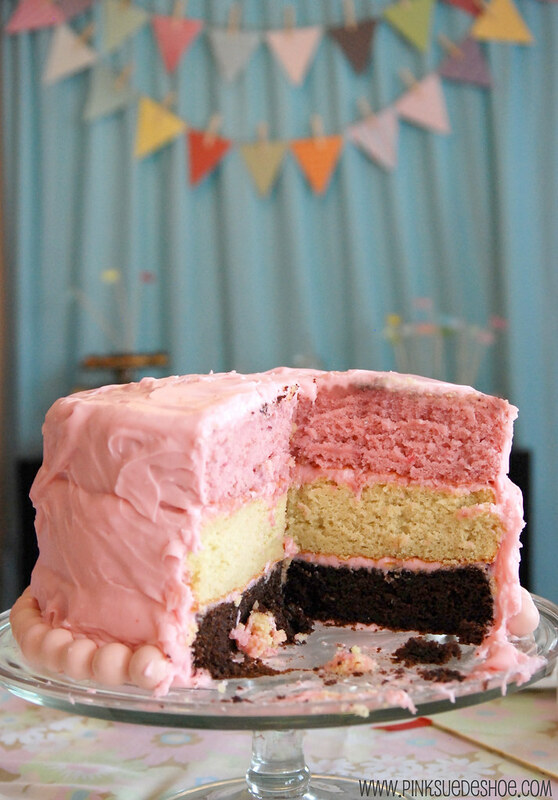 That neapolitan cake looks fabulous. Can I be on your next goodie delivery run? So glad you all had such a nice time together. I am so glad that the stars aligned, and your world is back in orbit. I enjoy your blog so much. Your’s the only one other than my girls that is listed in my favorites. You never disappoint. Creamie is lucky to have a wonderful, talented, creative mother. Thanks also for watching out for my baby. unphotogenic? I think not! I loved reading this. You are a great mom and so sweet. Thanks for being my (virtual) friend. Wow, this is so very sweet! Creamie is one lucky little girl. 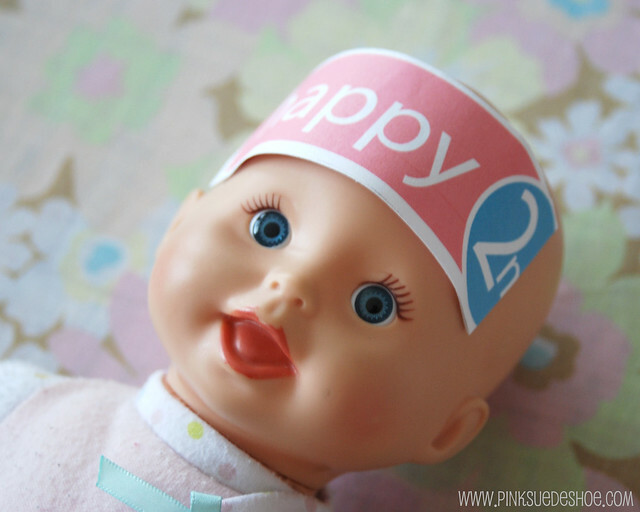 I adore your little cake toppers too!!! Let me guess, washi tape? Gorgeous. Hi there! 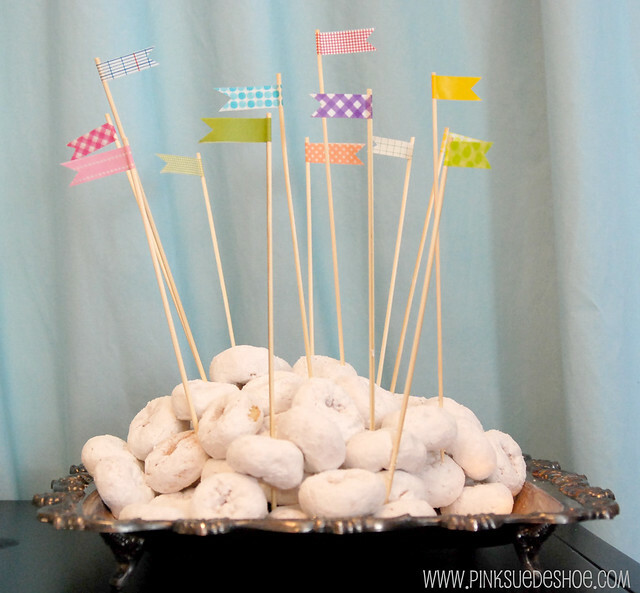 Your party for Creamie looks like it turned out amazing! The cake made my stomach growl. 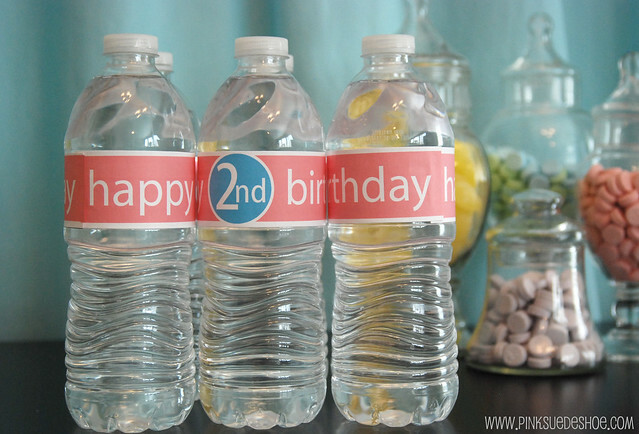 LOL I noticed you said that you used Illustrator to make the water bottle labels – was that with Adobe Illustrator? They look so professional! It looks like a dream! I thought I was pretty snazzy for making the rainbow cake for my little guy. But since the seven layers nearly put me over the edge, the only decorating I did was 3 balloons. You rock! That looks like a most fun birthday party!!!!! 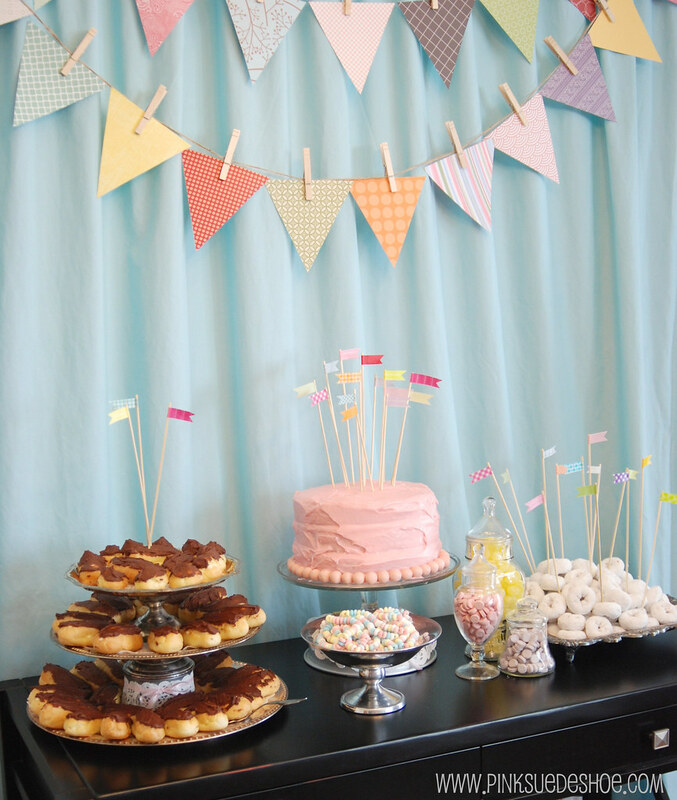 That dessert table is PERFECT!!! It is absolutely precious–well done! 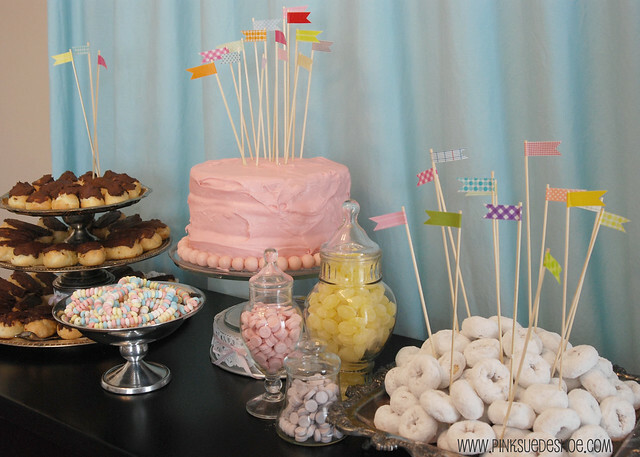 I especially like the Neopolitan cake!